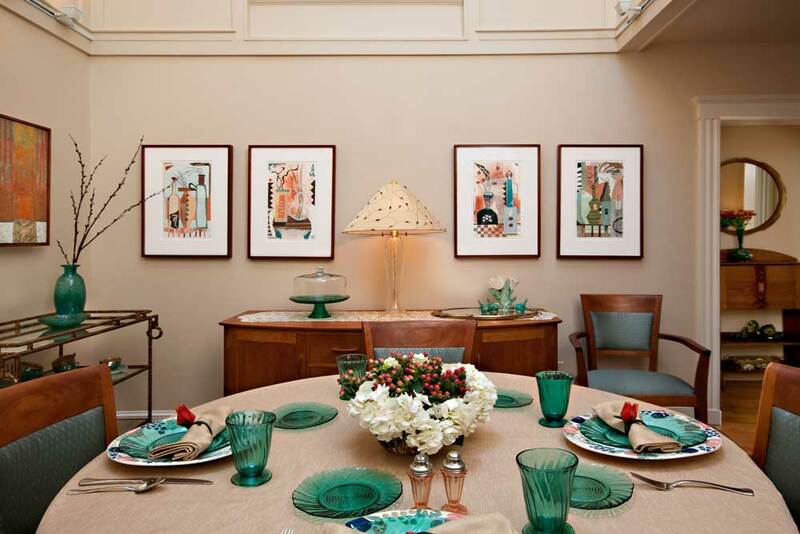 Dining Rooms: What is Your Holiday Party Style? The holidays, Thanksgiving in particular, are just around the corner. We can draw our loved ones together by delighting their senses with candle light, flowers and delicious food. Dining rooms are where we nourish our family, have birthday parties, and celebrate life’s joys. 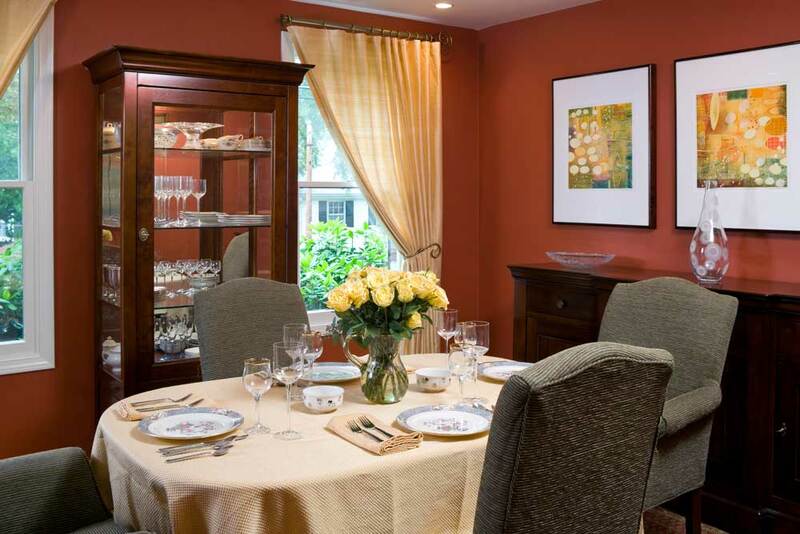 Dining rooms are where hostesses have the opportunity to start their own special family traditions. Relaxed, refined, formal, family friendly? Project your personality onto the sparkle of a sunburst chandelier lit with warm LEDs, shown here in Winchester, MA. 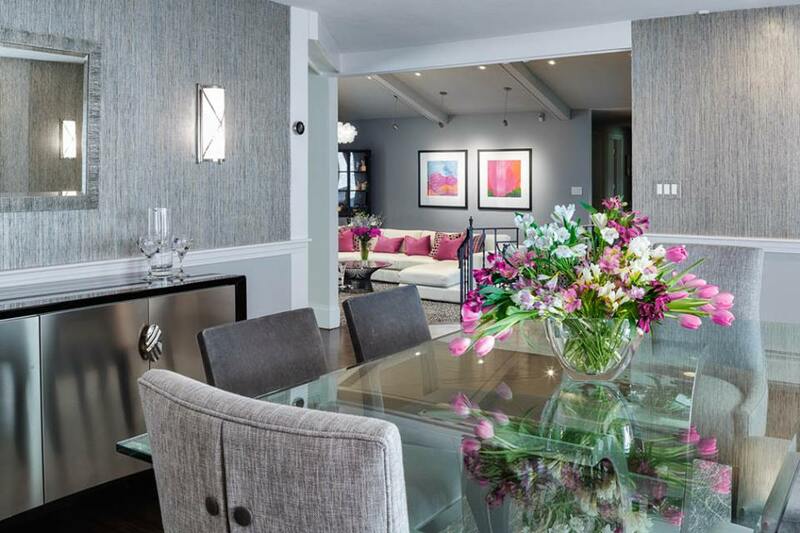 Be glamorous, but relaxed in a gray monochromatic dining room. Relaxed because the easy care glass table wipes clean. Add art, flowers, and drinks to stir a good time. The wool gray on gray carpet is from Stark Carpet. The Kravet Smart Furniture dining chairs are comfortable and cleanable. Now for some Mid-century modern, interior design. 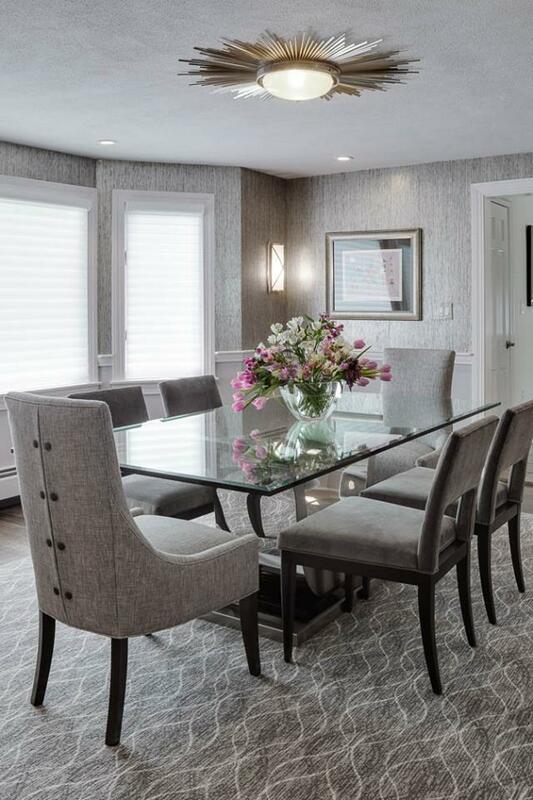 The owners of this house in Cambridge, MA share their passion for history by setting their table with their years-long collection of Depression Glass. 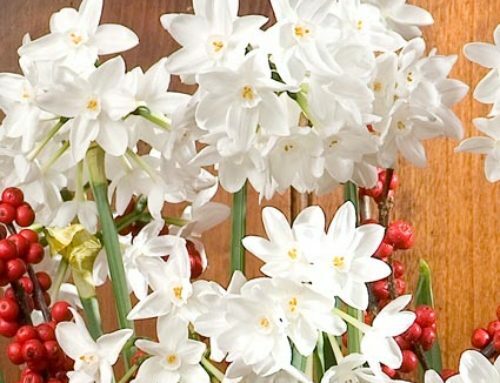 To be festive, add a low, color-coordinated floral arrangement (low enough to see the faces of guests opposite you). Spark table conversations with your travels through flea markets to collect the glassware and fine green pottery. Small Dining Room? Don’t Worry! If you have a small dining room, parties can be cozy and intimate. Some say six is the perfect number for uninterrupted discussions. This etagere from Grange adds light to the room while displaying stemware. 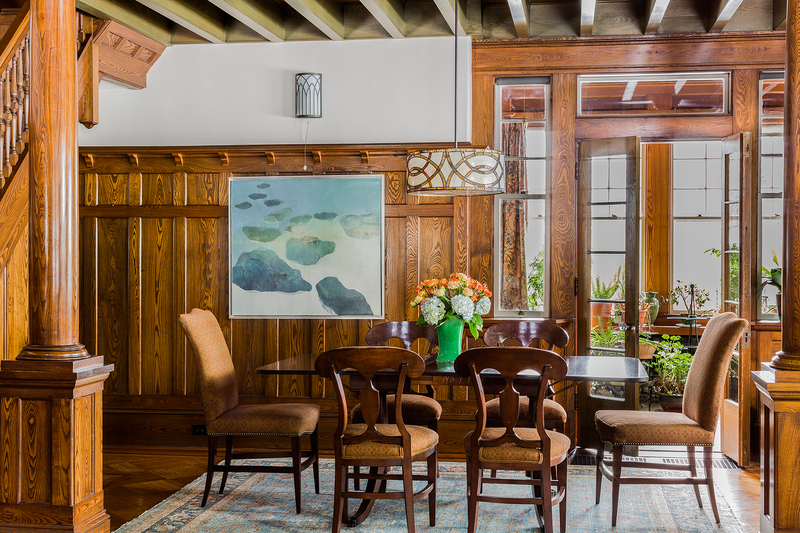 Deep persimmon walls are warm, and they stimulate conversation and appetite. Also, bold, warm colors are very flattering to most complexions! Rust, greens, and golds combine to make a perfect New England Fall palette in this home in Belmont, MA. Below, the color scheme shifts to blue, persimmon, and gold. This original Shingle-style home in Acton, MA also glories in our traditional fall color scheme. While there are many traditional decorating elements honoring the Shingle style of Frank Lyold Wright’s time, this contemporary seascape from the Powers Gallery lets the owner’s personality shine. Linda, from Inner Visions Interiors, would like to help you discover your personal entertaining style. Then we can furnish your home to reflect your good taste. Thanksgiving and every holiday is our opportunity to draw family and friends together in the spirit of generosity and affection. Show how much you love them by hosting a gathering that highlights your taste and personality. Contact Inner Visions Interiors at LindaStimson@usa.net to get started towards making your own beautiful family traditions. What is your favorite way of sharing celebrations?